The former stock exchange displayed nine digital price boards, a work by George Harvalias. The tumultuous events of the last years in Greece have seen hundreds of thousands of people rallying, striking and rioting to protest the waves of austerity measures imposed on the debt-stricken country. Protestors have repeatedly clashed with police, lives have been lost, unemployment has skyrocketed, and the government warned in 2010 that the nation was "on the brink of the abyss". This year's Athens Biennale set itself the courageous task of asking, "Now what?". Taking its cue from the notion of the agora as a place of gathering and collaborative reconciliation, the Biennale transposed an ancient discursive framework onto the holy mess of the present. Its bitingly resonant main venue was the former Athens stock exchange, not quite a ruin, but a scarred shell of a building in the centre of the city. The main hall of the former Athens stock exchange building on Sofocleous Street. This neo-Classical building opened in 1876 and was the trading floor for shares listed on the ATHEX exchange until it moved to another venue in July 2007. The nine digital price boards (the actual boards of the former exchange) was a work by George Harvalias, perhaps the touchstone of the biennial. It reproduced the share prices from the last day's trading in the building in 26 June 2007 when prices were near their peak value, with no sign of the subsequent catastrophic market crash to come. The text work on the balcony of the stock exchange hall was part of series entitled "New Behavioral Notes" (2012) by Dimitris Dokatzis, an Athenian artist of the same generation as Harvalias born in the 1950s. The words read "Money – Money! That is always the danger with you", a fragment taken from an Agatha Christie novel. Among the younger generation of Greek artists and the more veiled comments on the financial crises, Constantinos Hadzinikolaou showed "Peacock" (2003–13), a Super 8 loop of a male Peafowl's extravagant courtship display. One of at least three Spanish artists in the Biennial (besides Catalans Núria Güell and Ester Partegàs), Fernando García-Dory focused "on Pacific, Caribbean and Mediterranean islands as semi-enclosed ecosystems that stage the classic neo-liberal drama in which local economies succumb to the promissory spectacle of worldly paradise." The guts of the Biennale were a series of discussions, workshops and roundtables, and on 12 October 2013 the main venue hosted a fascinating, sobering and graph-filled economics conference, featuring blue chip economists from around the world including Heiner Flassbeck, Director of the Division on Globalization and Development Strategies of the United Nations Conference on Trade and Development. Poka-Yio, Biennale co-founder and co-director introduced the conference (photographed above). Paolo Manasse, Professor of Macroeconomics and International Economic Policy at the University of Bologna. This year's biennale is fully online, and can be followed on twitter #AB4AGORA, facebook, Instagram, Pinterest, Tumblr, Vimeo and YouTube platforms. Alternatively, for an overview of what's coming up, check out the biennale calendar. AB4 was put together by a large group of contributing curators and collaborating correspondents as well as through an open call for projects. One of the features of the exhibition was the presence of a number of artists from Chicago, reflecting the engagement of Stephanie Smith, Deputy Director and Chief Curator of the Smart Museum of Art at the University of Chicago. (Stephanie was a contributor to the Latitudes-edited "Land, Art: A Cultural Ecology Handbook"). Among them, Geof Oppenheimer stood out with his "Reversals" (2013) new work which grew out of the sifting of archival advertising and press images to comprise ambiguous montages of economic affluence and political intrigue (photographed above). At the Contemporary Art Meeting Point (CAMP, on 4 Eupolidos & 2 Apellou str. ), material related to four decades of socially engaged art in Chicago was presented under the name "Never the Same", the archive led by Daniel Tucker and Rebecca Zorach (photographed above). Of the artists more familiar from the better-worn paths of contemporary art, Gabriel Kuri presented "Quick Standards" (2005), which comprised four emergency blankets taped on wooden sticks. We were very grateful to curator and art historian Christoforos Marinos and his partner Xenia Kalpaktsoglou (co-founder and co-director of the force that is the Athens Biennale) for helping us in setting up some impromptu meetings with some impressive artists while we were in Athens. We managed to meet Vangelis Vlahos, Kostis Velonis, Rallou Panagiotou, AlexandrosTzannis, Kernel (an artist/architect curatorial collaboration of Pegy Zali, Petros Moris and Theodoros Giannakis) and Dora Economou. 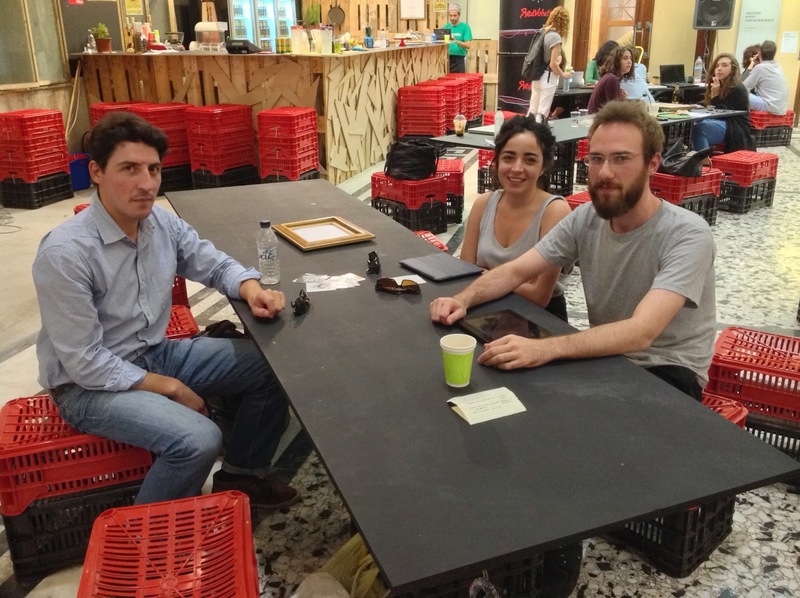 (Above) Kernel (Pegy Zali, Petros Moris and Theodoros Giannakis) at the café of the Athens Biennial. Apart from the Biennial, elsewhere in Athens, the Deste Foundation/Dakis Joannou Collection presented "The System of Objects", a show inspired by Jean Baudrillard's 1968 book of the same name. Curated by Andreas Angelidakis with Italian curator Maria Cristina Didero, the show extended over densely-installed rooms which were, as Angelidakis suggested "a little bit like floating down that river of the internet... Cypriot antiquities float alongside major installations by Maurizio Cattelan, paintings by Jeff Koons and worn out red vinyl tights from American Apparel? A seminal Archizoom chair from 1968 floats next to a painting by a Cypriot artist given to Dakis ages ago? Really?". And of course what visit to Athens could ignore the treasures of the National Archaeological Museum? Of the objects on show, the finds from the Antikythera shipwreck were perhaps the most astonishing. Dated to 60–50 BC, they came from what experts believe was a freighter packed with Greek art headed to Italy. Ancient reminders from the dawn of the art trade, the antiquities – half consumed by the sea – were brought together for the first time in a special exhibition.